It was a little overcast yesterday, and they were calling for showers in the morning. But it was supposed to clear throughout the day, so around 10:00am, we headed out on a hike. Our couchsurfing host Mark had given us directions for a nice 7 km (4.4 mile) trail that we could reach on foot from the house. 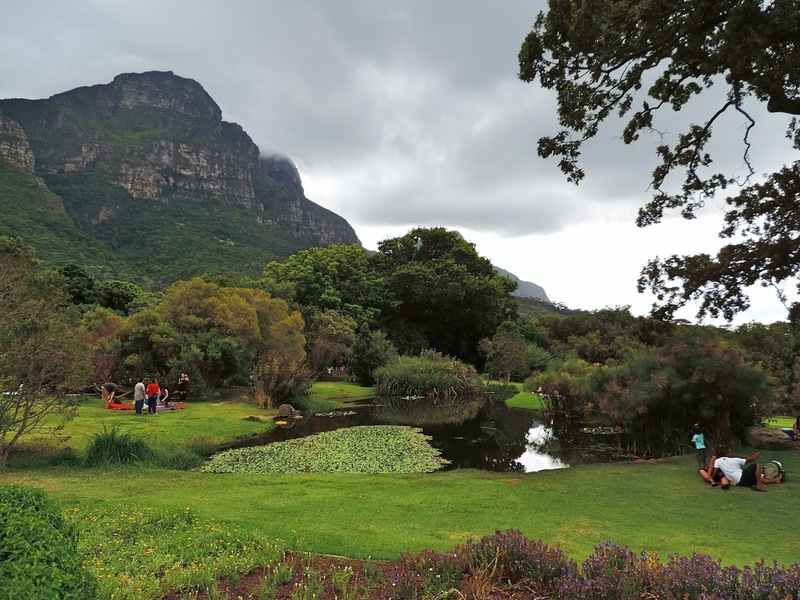 It would lead us from the Rhodes Memorial to the Kirstenbosch Gardens. 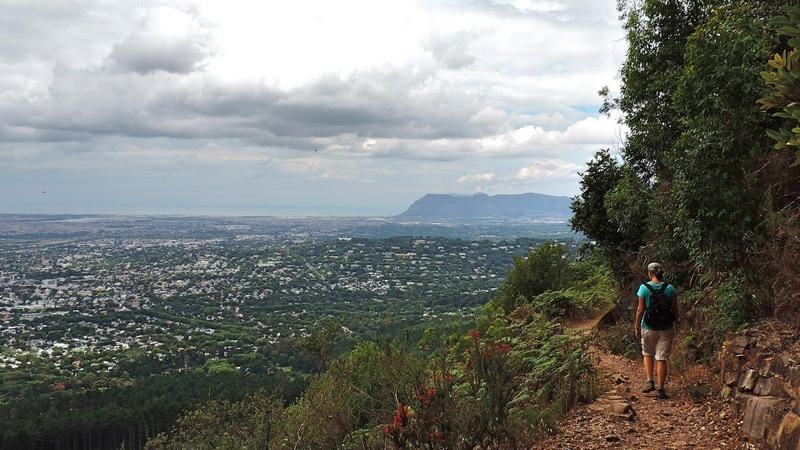 There are a lot of hiking trails in and around Cape Town. Just the fact that they have this huge mountain range pretty much in the middle of the city guarantees a wide variety of hiking without really having to leave your doorstep! You can see the Rhodes Memorial on the right, just under the mountain. Good thing we decided not to go to the top of the mountain. It looks a little hazy up there! Taking a break, and enjoying the view. 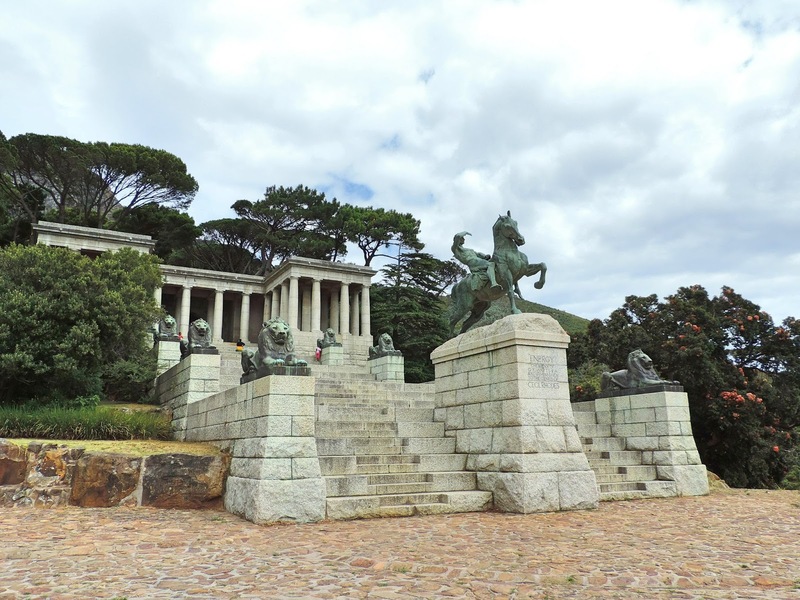 The Rhodes Memorial was built in 1912. Cecil Rhodes was a young British mining magnate and politician who believed in British colonialism. He essentially founded the African territory of Rhodesia (now Zimbabwe). He died in 1902 when he was only 49 years old. 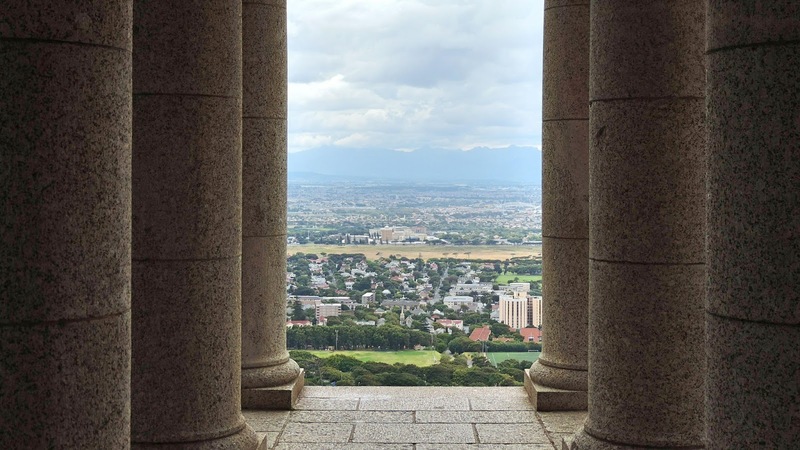 Great views of the Cape Flats area from the Rhodes Memorial. We continued our hike south along the base of the mountain. This area of South Africa is home to over 9,000 species of flowering plants. It's actually an amazing region in that regard because two thirds of those species occur only in this region. This strange flower is about the size of your fist. The petals look like lit candles! Great hiking trail. Just the way we like it! It was almost 2:00pm by the time we made it to Kirstenbosch Gardens. This Gardens is very popular with Capetonians and on a Sunday afternoon it was still pretty busy despite the cloudy sky. Which was getting worse instead of better. There had been a dark cloud hanging over the mountain all day, and it seemed to be getting darker. Relaxing wandering around Kirstenbosch Gardens. Sure enough, eventually the clouds broke open. We found some shelter and waited out the rain. Stood there staying dry for about a half an hour and then tried to figure our way home. We ended up taking a regular metered taxi. Metered taxis cost R10 ($1.05) per kilometer, so the total for our ride was R72. Including tip, I gave him R80 ($8.40). Not bad for a private taxi, and we were lucky to get a good driver who played tourist guide for the whole trip back. We stopped at a major grocery store on the way back, but the stores close early on Sunday. This particular one closed at 2:00pm. So we were planning on taking Mark out for dinner, but he turned the tables on us and had already done some shopping while we were out hiking. Had a nice gluten free pasta meal and a bottle of wine. He's back at work this week, so we'll be on dinner duty! Great hiking! Mark seems like a wonderful couch surfing host. I don't know many people that would cook a gluten free meal. 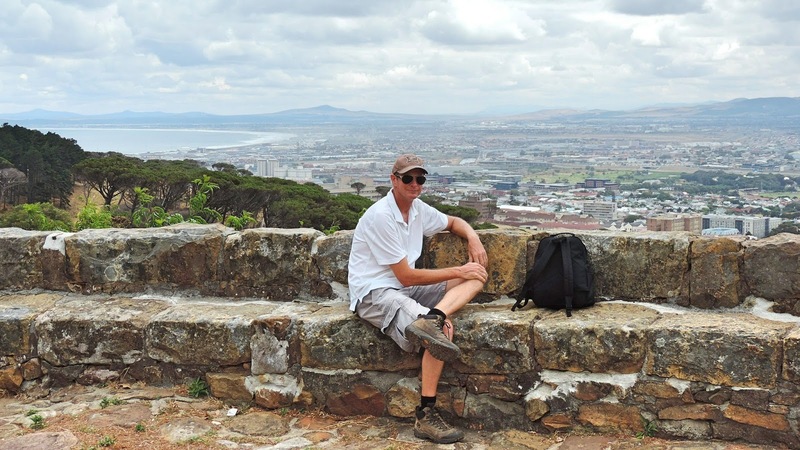 It was a great hike and we really enjoyed being out on the mountain and seeing the sights of Cape Town all around us. Mark has been a fantastic host and we haven't been able to thank him enough. Thank you Dianne, we have certainly seen some beautiful places and met wonderful people since being in Africa but we have only been to two countries so far and Africa is a very BIG place so I am sure that there are some countries in Africa that are experiencing these effects. People need to remember that Africa is a continent with many countries and no two are the same. That was nice of Mark to cook you a nice gluten free meal. Yes, it was very nice of him to do this for us. When you hear of someone being a 'Rhodes Scholar" is that where it comes from? Yes, it was named after Cecil John Rhodes and is the world's most prestigious scholarship which is offered to for selected foreign students to study at the University of Oxford. Fantastic photos again - what a fun hike - and staying with Mark sounds like the ideal couchsurfer experience! Thanks once again Connie and Barry and yes it was a fun hike. Couchsurfing with Mark was so fun we are going to do it again at the end of February. Great views on that hike. We can't wait until we can hike to the top of Table Mountain when we can get some fantastic views! That flower looks similar to a protea that I have seen in Hawaii. Kevin looks like he has lost a lot of weight! Yes, it is probably in the same family, it does look similar. Actually Kevin has mentioned that his pants are getting tighter around the waist rather than looser. He does feel like he has been gaining weight and he has been feeling much better for it. Nice hiking area for sure, love the plants and flowers!! It was a beautiful hike and the plants and flowers were beautiful in the botanical gardens of Kirstenbosch. He may have founded Rhodesia but he spent most of his adult life in South Africa and was big wig in the diamond mines and he was also the 7th Prime Minister of the Cape Colony in 1890. You can read more about him Wikipedia. sorry that one part of the trail a little too close to the edge for my comfort. as usual great pics and background. Wonder why the monument was built so high up? so 'he' could view the city? I image that he wanted to be able to over look the city. Also the university is right beside it on the hill and he had the university built. If you think that was close to the edge you should see the hike we did on Lion's Head.